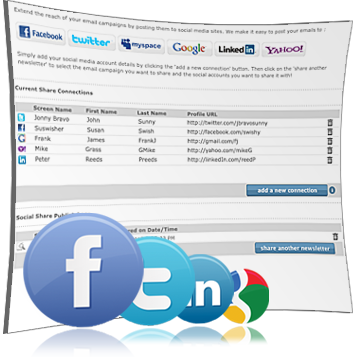 Publish your email newsletters to your social accounts such as Twitter, Facebook, MySpace, Gmail, LinkedIn and Yahoo. Why? This way, you can simply channel your marketing efforts into social networks (the online word of mouth). Sharing your content through social networks makes it easy for your followers to access and share it with their contacts, so your audience keeps growing. This is what we call smart publishing and it places your brand a step ahead in the new search trends that now include searching through social media content.